I'm thankful we didn't work out. It was fun while it lasted, but all seemingly good things must come to an end. On the surface we may have seemed happy and "meant to be", but I'm thankful you weren't the one. There was always something that was off, and looking back it's crystal clear- nothing about what we did, where we went, or how we acted brought out the best in each other. When you take away our failed attempt at a facade, you're left with two mismatched people pretending they're equally yoked. You will help me appreciate the right person, and be an example of what I don't want to repeat in the future. For this, I celebrate our choice to part company. I'm thankful we're no longer friends. People grow and change. Not everyone we meet is meant to spend forever with us. While they may have been critical to our growth, development, and shaping the person we are today, that doesn't mean they are going to continue to help catapult us into the best version of yourselves. As our goals and values evolve, it's only logical that we would surround ourselves with people who offer the love and support we need to continue to succeed. Sometimes to remain fully focused on that, we need to walk away from those who are toxic and draining to our spirit. You have helped me love the "through-thick-and-thins" even more, and reminded me that although we may not get along everyday, some people, (the best people), are willing to offer their hearts to you even when you don't deserve them. I'm thankful I left that job. Leaving a job is hard, wether by force or by choice. It's scary and requires us to swallow our pride and accept that whatever opportunity we were pursuing is no longer a fit. It makes us uncomfortable. Moving from one job to the next is often a pivotal transition. It challenges us to rise to the next occasion, and find ways to leverage what we've learned. We are forced to create a new space to thrive. It requires us to move forward with conviction, remain motivated, and trust that our next move will guide us to where we are ultimately supposed to be. Leaving helped me find joy in even the most monotonous tasks, and introduced me to an entirely new group of people that were ready to inspire. I'm thankful things aren't moving as quickly as I wanted. We live in an instant gratification world. Our coffee is ready in under 30 seconds, our cars can be warmed before we're even in them, and we can find anything we want with a few taps on our iPhones. But not all things in life move this quickly. When I've looked back and found myself in a not-so-different place than a year ago, the anxiety kicks in, and I start scrambling for a fast forward button. To our benefit one doesn't exist. Things will happen when they are meant to happen, and oftentimes our circumstances have shifted just enough in the right direction, without us even noticing. Sometimes our next blessings can't be released until we take the time to appreciate our current ones. There's a reason things haven't changed. There's a lesson we haven't learned or a thing we haven't accomplished that's waiting for us. 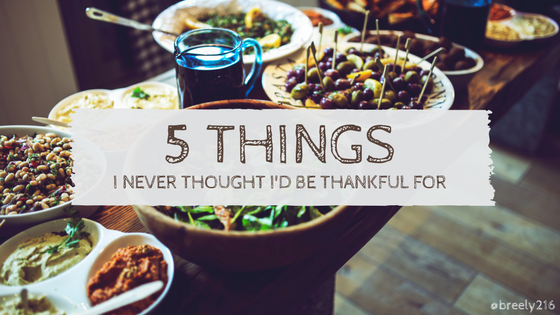 I'm thankful I didn't get what I wanted. The list of things that I've begged, pleaded, prayed, and cried for is endless. The list of things I've actually gotten has paled in comparison to my wish list. Hindsight is always 20/20. When I reflect on the way certain things have played out, I find myself thankful that I didn't get my way. Had I have gotten my way, my life would look nothing like it does today. There's always something going on behind the scenes and more to the story. Rejection is God's protection. Meditating on all of the "close calls" makes dealing with daily denials easier. It's never a "no" for no reason. We're being saved from something that wasn't meant for us. What do you want to do before you die? It’s not a light question, but it’s one that we often respond to with light and ambiguous sentiments. No one ever seems to offer goals with remarkable motives or backstories, or lofty unattainable achievements. What I’ve noticed is, people always list dreams that are absolutely attainable in a lifetime. To these responses I pose the follow up question, “What kind of steps are you taking to achieve these goals- the things you want to do before you die?” I’m often met with sad stories about a lack of money, a lack of time, or a lifestyle that simply won’t permit them to ever achieve the things their heart desires. That doesn’t answer my question. Reasons why your dream will never come true is not the answer to what kind of (baby) steps you are taking every day to achieve them. Why? Why the excuses? Why do we feel like our current situations dictate our forever? Why are we so crippled by the tunnel vision of our day to day to see the big picture? Why do we not believe we have it in us to accomplish the things we ACTUALLY want out of life? I was raised to believe that I could do anything. It was never a matter of “you can’t” but “how can you?” It was never “you won’t” it was “when you do”. I was taught to outline the steps, and mentally walk through the thought process of how I could materialize what I fantasized about. If you grew up in a world where no one ever told you can be anything, have anything, or achieve anything, I’m here to tell you that you can. If you were ever led to believe that your grandparent’s circumstances, or your parent’s circumstances, or your circumstances today define your forever, I’d like to tell you that’s a lie. YOU have the power, authority, and control to dictate what the rest of your life is going to look like. You have the ability to take control of your destiny and mold it into the thing that you’ve always dreamt it should be. Your life today is not set in stone. If you don’t like something in your life or about yourself, make a change. Simply make a change. The change doesn’t have to be drastic or grand. A small effort and step in the direction toward the life you want to create, has the potential to change your journey forever. Why not? What do you have to lose? If you don’t like the change you made, make another one. Choices are fluid; they’re not made of concrete. As you conquer the small wins your confidence will grow, and you will begin to learn that you have that power in you too. Once you’re accomplishing the goals that you once felt were so lofty, that will open doors for you to dream even bigger. Traveling to an exotic destination will seem like a weekend getaway in comparison to things that you can set your mind to. Don’t stop dreaming. Don’t let your day to day dwindle your dreams while you’re working toward them. You are better than that.